“The President’s enemies don’t want him to succeed, but Americans are saying, ‘Let President Trump do his job,'” the ad said. The Trump campaign did not respond Sunday to requests for more details on the ad, including when and where it will run and how much it cost. Trump took office following years of decreasing unemployment rates, and those numbers have continued to improve during his time in office. The US economy added more than one million jobs since Trump was elected. The stock market has reached record heights by some measures as well, continuing a trend since recovering from the Great Recession, with a strong increase since the November election. The release of the Trump campaign’s new ad comes as the President continues to receive criticism for his statements Saturday in response to the violence that wracked Charlottesville over the weekend. White nationalists gathered in Charlottesville and clashed with counterprotesters Saturday, violence that culminated in a man driving a car into a crowd, killing a woman and injuring 19 others. Two Virginia state troopers died the same day in a helicopter crash while assisting the city’s response to the violence. Trump gave a statement Saturday condemning the violence and bigotry “on many sides” and touted his own record, including low levels of unemployment and announcements by companies such as Foxconn, an electronic components manufacturer headquartered in Taiwan, which plans to increase production in the US. “We have so many incredible things happening in our country, so when I watch Charlottesville, to me, it’s very, very sad,” Trump said. 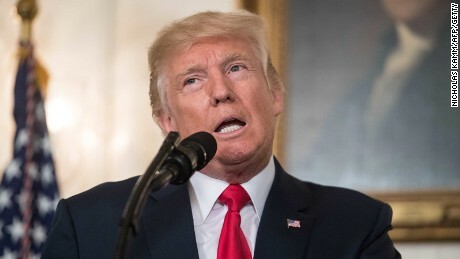 But in his remarks, Trump did not single out white supremacists as responsible for the violence, drawing criticism from some congressional leaders within his own party. Senior administration officials said Sunday that Trump was referring to white supremacist groups in his remarks. Pressed on “State of the Union” about the President’s position towards the white supremacists, White House homeland security adviser Tom Bossert offered a condemnation of all hate groups and said Trump felt the same way. “I condemn white supremacists and racists and white Nazi groups and all the other groups that espouse this kind of hatred,” Bossert said. Trump declared his intention to run for re-election at the very beginning of his presidency and in recent months has taken part in several campaign events, including holding a $35,000-per-seat fundraiser in June.